That’s how Michael Cooper, MP for Edmonton-St. Albert, described the April 25, 1999, event in which an estimated 10,000 Falun Dafa adherents gathered in Beijing to peacefully protest the hardening tone of state-run media against their practice and the wrongful arrest of their fellow practitioners in nearby Tianjin. Cooper was speaking at a rally held in Edmonton’s Dr. Wilbert McIntyre Gazebo on April 22 to commemorate the anniversary of the appeal. 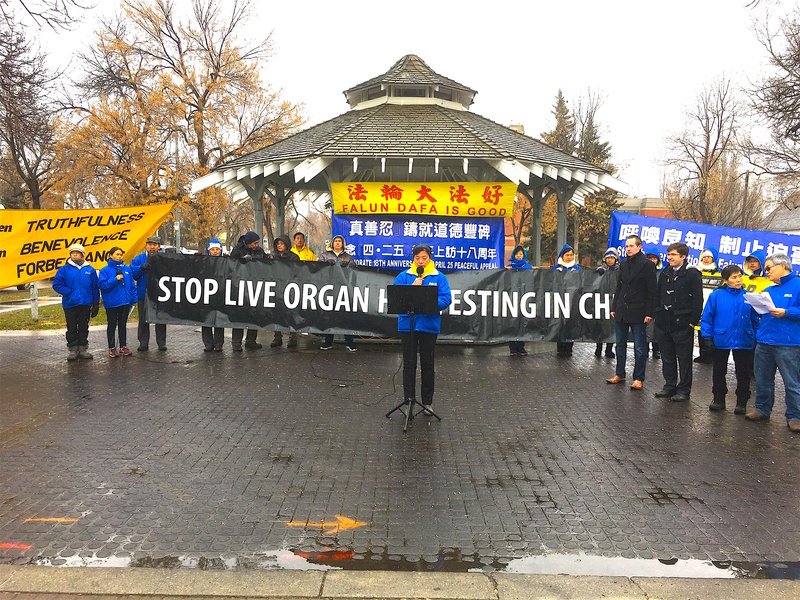 The rally also heard from Garnett Genuis, MP for Sherwood Park-Fort Saskatchewan, and adherents of Falun Dafa (also called Falun Gong) who experienced persecution in China. It was the largest peaceful pro-democratic demonstration in China since the Tiananmen Square pro-democratic demonstrations of 1989. It was a remarkable feat. The protest was the largest appeal for freedom of belief in China’s recent history, and the last time Falun Dafa adherents were able to gather before the brutal persecution against the practice was launched in July 1999 by then-Chinese Communist Party (CCP) leader Jiang Zemin. “It’s an honour to be here to stand with [Falun Dafa adherents] for truthfulness, compassion, and forbearance, to stand in solidarity to commemorate the brave 10,000-plus men and women who [gathered] in Beijing on that fateful day of April 25, 1999,” Cooper said. Truthfulness, compassion, and forbearance are Falun Dafa’s guiding principles. “Men and women, who stood up for justice, who stood up for freedom, who stood up for human rights, who stood up for the dozens of Falun Gong practitioners who days earlier had been rounded up, arrested, and beaten. It was the largest peaceful pro-democratic demonstration in China since the Tiananmen Square pro-democratic demonstrations of 1989. It was a remarkable feat,” he said. But the response of the Chinese regime was typical of a “brutal communist dictatorship,” Cooper noted. Just three months later, Jiang’s regime launched a campaign of persecution against Falun Dafa, which in the past 18 years has resulted in thousands of families being destroyed, many sent to labour camps, many tortured to death, and many more losing their lives in China’s illicit state-sanctioned organ transplant trade. “In the face of some of the most egregious human rights abuses and crimes committed in the modern world by the communist dictatorship of China, how have Falun Gong practitioners responded?” asked Cooper. Canada can play a strong role, standing up for universal human rights. We have a responsibility to do that, especially when the government talks about increasing our engagement with China. 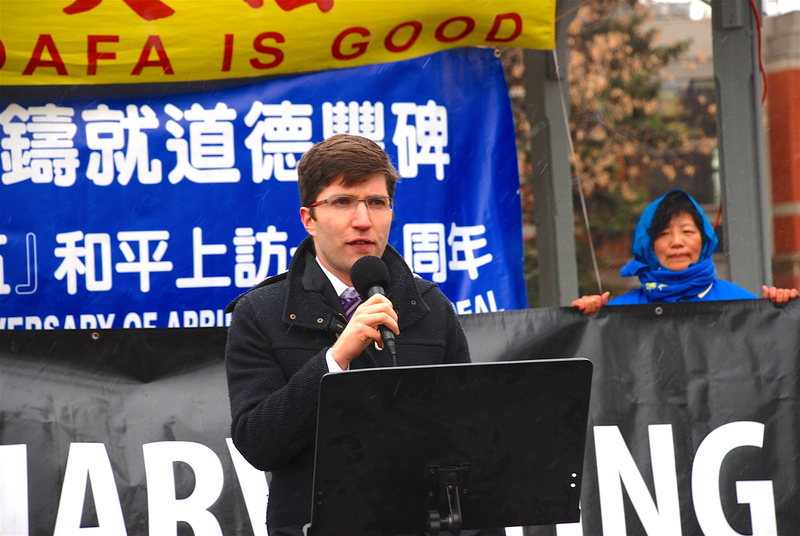 Genuis, who recently introduced a private member’s bill to combat forced organ harvesting from prisoners of conscience in China, said persecution against all faith communities in China is on the rise. 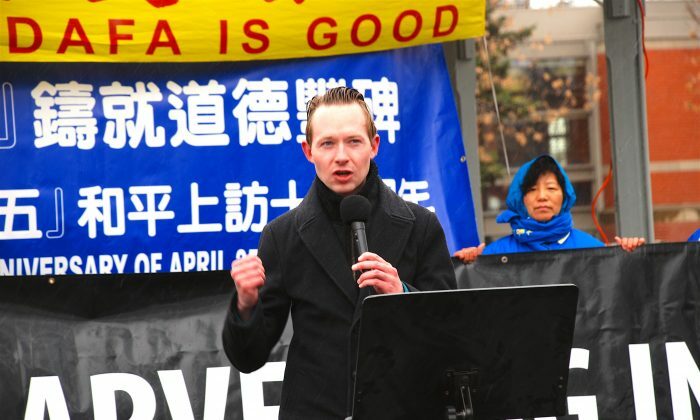 “As China does its best to whitewash its international image, the persecution is escalating, it’s getting worse, and it requires a strong response from those of us in the West and throughout the world committed to justice and human rights,” he told the rally. Genuis’s bill C-350, which revives a bill tabled in the last parliament by former Liberal justice minister Irwin Cotler, amends Canada’s Criminal Code and Immigration and Refugee Protection Act. The bill seeks to make it a criminal offence for someone to acquire an organ that they know was obtained without consent, and to make those involved in forced organ harvesting inadmissible to Canada. According to investigations by former Canadian secretary of state David Kilgour, Canadian human rights lawyer David Matas, and American investigative journalist Ethan Gutmann, up to 90,000 organ transplants take place in China on a yearly basis, with the majority of them being Falun Gong prisoners of conscience who are killed for their organs. “Canada can play a strong role, standing up for universal human rights. We have a responsibility to do that, especially when the government talks about increasing our engagement with China,” Genuis said. 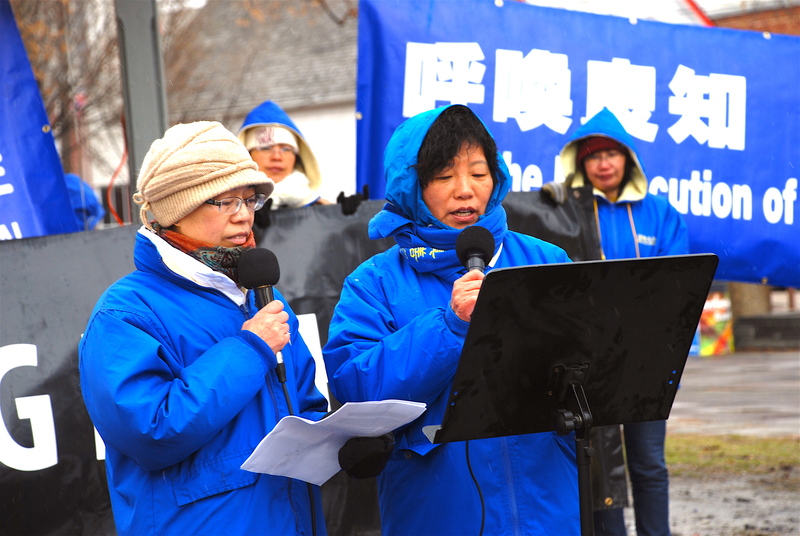 The rally heard from two Falun Gong practitioners who personally experienced persecution while in China. 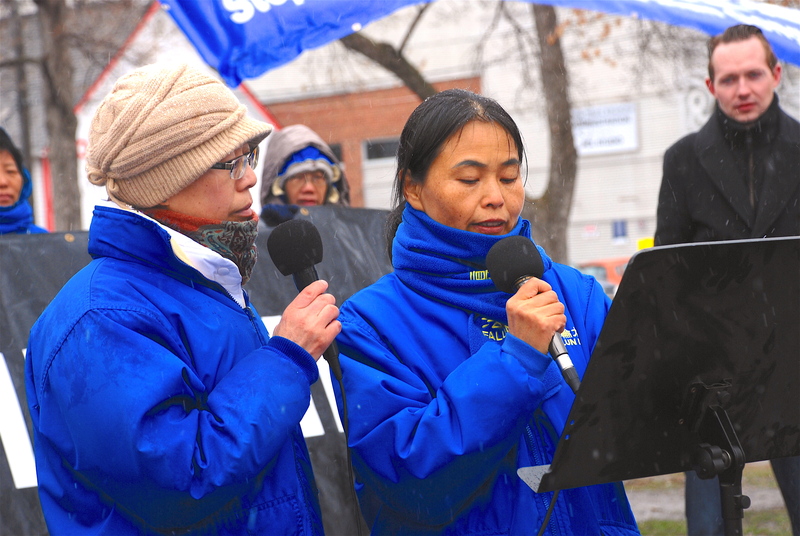 Calgary resident Jiang Hong relayed in an emotional speech through a translator that her father, Jiang Xiqing, was put in a forced labour camp and tortured for practicing Falun Gong. Jiang Xiqing fainted under torture, and was then cremated while he was still alive, a tearful Luo said. Zhang Ping, also from Calgary, talked about how both her physical and mental state improved with the practice and how she was able to harmonize her relations with family members and those in her community, thanks to Falun Gong. However, due to the CCP’s campaign of persecution, she was arrested and detained on multiple occasions. She finally escaped China to come to Canada in 2015. “After leaving my hometown, within less than a year I heard about three more fellow Falun Gong practitioners who died of persecution,” she said.